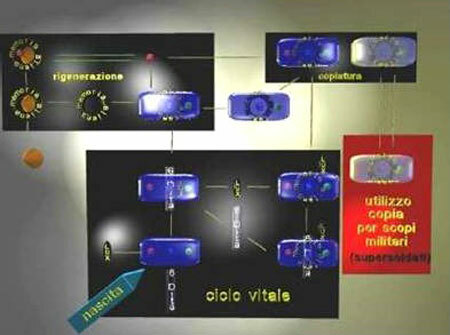 This is a summary of the research of Dr. Corrado Malanga concerning the alien abduction agenda. It mentions the aspects of aliens as parasites, cloning and how they utilize human soul energy as batteries. 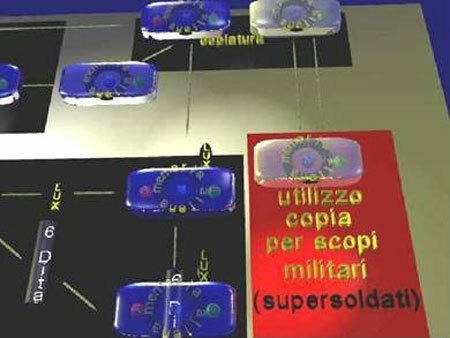 This explains many abductees memories of MILAB ops and military training exercises in dream states. In order to better explain what an alien interference is I will use a three-dimensional flowchart for the whole phenomenon, as it is already described in the book Alien Cicatrix. Before explaining the entire sequence of the alien action process on the abductee, we need to introduce the different characters in this story. They are represented here by special objects to ease their recognition in the flowchart during the abductee’s life, when the issues related to the abductions manifest themselves. As you can see in the following diagram, which we will read starting from the bottom left corner, there’s a blue parallelepiped that represents the abductee’s body. If we proceed upwards we can find three spheres having different colors. 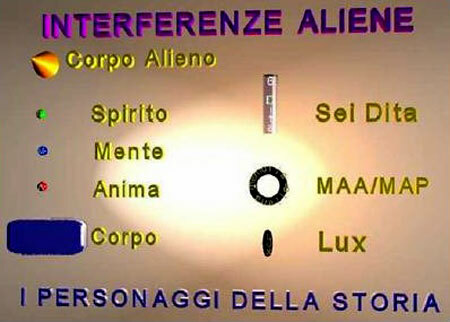 These three entities are an integral part of the abductee, whose vital essence is completed with his body. Above, still on the left, there’s an orange cone, representing the alien’s body. These are the names we used also in Alien Cicatrix. At the bottom right we can see a black ellipsoid with the word LUX: this is the Light being. Going upwards we can see a toroid with the word memoria aliena (alien memory), which represents the Alien Memories, both the active and the passive ones. The AAM (Alien Active Memory) or the APM (Alien Passive Memory), exclusively belongs to the alien species we already mentioned. Going still upwards there’s a transparent cylinder with the word 6 Dita - 6 fingered , which represents the extra-dimensional parasite that can have at times an artificial body (created with a machine), and characterized by a humanoid ephebic structure: white haired, with various shaped pupils and six fingers. In order to follow all of these characters, we need to use this symbology to outline the abductee’s life. 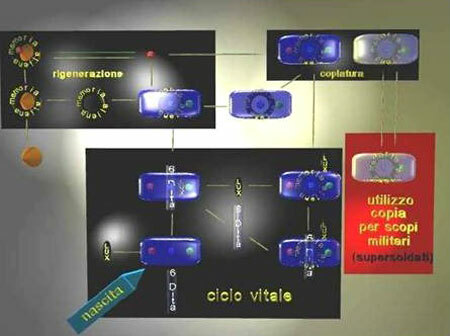 The whole picture, even if it could seem at first hard to understand, actually includes simple smaller windows having a black background, which are called CICLO VITALE (vital cycle), RIGENERAZIONE (regeneration) and COPIATURA (copying), and finally a window with a red background named supersoldati (supersoldiers). We’ll consider the whole scheme in detail at the end of this section, but let’s look at the starting point now: the moment when the abductee is born. When the abductee is born, he has a body containing a Mind, a Soul and a Spirit, having their own Consciousness, and since they are overlapping, they are not aware of being the sum of three different things. It is now that the LUX starts to parasitize the abductee, and the also by the Six fingered alien hooks itself to the abductee. In particular, the LUX parasites the person even before the fetus is detached from the mother’s placenta. The Six fingered alien, as it is described in Alien Cicatrix, will intervene only later on, when it is convenient for him to make use of the abductee Soul’s resources; now it is not possible to know exactly when, but this is not particularly important. We are still in the first few days of life, or actually in the first few hours, when the newborn is already taken through a physical abduction. At times this kind of interference takes place when the abductee is still in the mother’s womb and still connected to the placenta. The “soon to be abductee” Consciousness tells that “those beings” need to program her/him: this programming places in the newborn’s brain the so called Alien Active Memories (AAM) in a forbidden access area. The programming can use different techniques, depending on the alien which performs it. As an example, the Saurian alien uses the abductee’s optic nerve as a “transmission cable”: he inserts the data in a way that looks to the to the abductee, during the hypnosis, as a series of electrical stimuli appearing as images and colors. Now that the abductee has already been parasitized by the LUX and the Six fingered, he/she is taken again, they momentarily take out the LUX and the Six fingered in order to avoid useless interferences, and he/she gets to be re-programmed introducing an Alien Active Memory. The abductee, in the bottom right part, is programmed using an Alien Active Memory and in the meantime they momentarily take out his Soul component (the little red ball). The Soul is used in a regeneration cycle: it enters in the alien’s body that has his own Mind and Spirit (AAM), and revitalizes it, so to guarantee his physical survival. Then the alien is split up: the body goes in a “fridge”, if we can say that. In the worst alien worst case scenario the alien body could be already dead, and so the corresponding AAM is then left in the the abductee’s body until it is possible to find a new place for the AAM in a newborn alien body. So the Soul stays for just a few seconds in the assembled alien (upper left), but she must then be absolutely put back again in the the abductee’s body, which is the only one where she can permanently stay. Now let’s see what happens when following the arrow pointing upwards on the right. Through this operation (taking out the Soul, T.N. ), repeated at least twice a year, the Soul revitalizes the alien, which in this way will not die, neither in his body, nor in his Spirit and Mind. This revitalization cycle takes place regardless of the presence of the AAM and for all the alines who need it. Moreover she supplies her energy, every now and then, also to the LUX and the Six fingered, who do not need to take her body away. 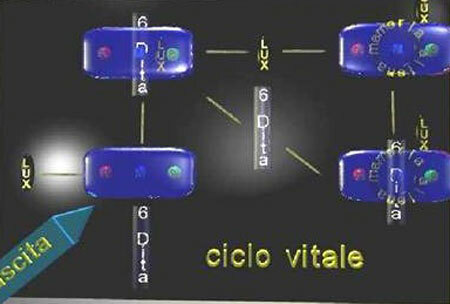 The LUX actually parasitize the abductee continuously, and the Six fingered has an optimum Mind control on the abductee, which he uses on the abductee’s mind while he is comfortably closed in his place, in his dimension, probably using a console or some kind of tool which communicates with the abductee. As we already said in Alien Cicatrix, the Six fingered alien uses a physical body only when he needs it, but he actually does not have a body, just like the LUX and the AAM which don’t have a body. He partially disconnect the abductee’s Soul and brings it to his dimension, and there, with no hurry and using the proper equipment, he draws the energy he needs. After this “milking process”, the Soul, which never totally disconnects from the the abductee’s body, not even in this lapse of space-time, gets to be normally connected again to the body of the legitimate owner until the next exploitation. As we can see in the picture below, while the Soul undergoes this treatment, the abductee’s body, together with his Spirit and his Mind, are temporarily free from the Lux and the Six fingered as they undergo the “copying” process. Each abductee’s component is copied/cloned, except his Soul, which cannot be copied for a thermodynamic reason: one cannot indeed copy something that never dies. The thermodynamic laws do not allow it or the energy of the entire system wouldn’t be conserved (conservation of energy law). The Soul goes back into the original, while the copy, which is light pink-colored, is used for quite different goals. As we can see from the scheme above, the copy gets all the information of the AAM. If the abductee was to accidentally die, the contents in his AAM would be lost, and that would be a great damage for the corresponding alien, since “maybe” they would have just an empty body left. The alien’s Mind and Spirit would be inevitably lost, and the alien would be forever terminated. Hence the need to create a copy of the abductee to store alien contents in it. In this context, we need to also consider the revitalization procedure for the copy: the Soul gets out of the original and also enters, for a few seconds, in the copy, to bring back life to it. That’s the reason why, every so often during his lifetime, the abductee gets to be copied all over again. The copying and the revitalization procedures are done in special rooms, that we called the “cylinders rooms”, already described in Alien Cicatrix. We need to point out that each time a copy is revitalized, it automatically performed a memory backup. 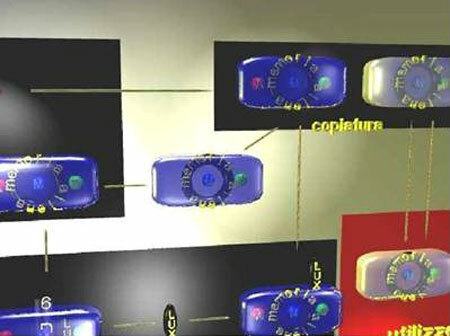 This is a process in which the original and the copy are being compared with the respective memories and are integrated in order to avoid inconsistent memories in the future. Often times, when an abductee gets to be taken for a period of time which is way longer than the usual 45 minutes - because the work that the aliens need to complete is bigger and because of possible space-time distortions that cannot be excluded for the abductee - they leave one of his copies to replace the original. If this copy was to be carefully examined by the abductee’s relatives and close friends, they would find that it is actually different, and, knowing the abduction underhand work, it would be possible to verify this, since the copy is not perfect. But usually nobody thinks about abductions, so the family is happy through explaining the differences just saying that the person was more different than usual only that day… but then they would re-examine all of the events if using the new light shed by the alien interference phenomenon information given here. In this way we can understand why there are some abductees who don’t remember very important events in their lives, for just a short period of time, or they cannot recognize their husbands/wives, children or their closest friends. In this way it’s easy to explain why some scars easily come and go on the abductees’ body, or when they cannot find their piercings, or if there are two different memories for the same event. The copy, even if he is not aware of being such, must be able to correlate with the abductee’s family and environment without arousing suspects. But it also seems that the memory backup is not perfect and there are wrong fragments inserted in the copy’s memory, or the other way around. since our Mind, actually our brain, is a write-only hard drive, it might happen that the original has two different piece of memory which are inconsistent with each other, or that there are pieces of memory which are non-credible. if the abductee is taken, then copied and his copy is placed in the car where the original was taken from, the latter (the original, T.N.) sees his copy coming down into the car, and when he remembers that event during an hypnosis session, he remembers to be up there and to see himself going down into the car, but… he was driving at first… and what happens in the middle of that sequence? There’s nothing in the middle, since the copy is the one remembering his descent in the car and then driving, while the original doesn’t have any memory about that. So they need to cut the original’s memory at a certain point, and then attach the copy’s memory; even if there was a little mistake, that’d create a big mess. Even if there was no mistake there’s a damage: they just try to minimize it. When carefully examining these memories during hypnosis, one immediately finds out that there are inconsiderate cuts and where these are. There can be people who totally lost their memories related to years and years of life. So, two different experiences differentiate the copy from the original. Eventually the original goes back to the Earth, after introducing again the LUX and Six fingered parasites back in it. The AAM now will always stay there: only if a possible alien body will be ready to receive the AAM, this latter will be detached from the abductee and restored again in the alien body. But in the abductee’s memory there will always be a copy for the alien’s memory, which we call in this case APM, that is Alien Passive Memory. The difference between the AAM and the APM is that this last one contains only a Mind, but not a Spirit; only the alien’s Mind, and so it actually doesn’t have any Willpower. In other words, the abductee is not parasitized anymore by an alien Willpower, but he will still and always have that recollection of memories, since, as I pointed out many times already in my work, the brain works like a write-only hard drive. Let’s see now what is the destiny for the copies and the original. We can see the original in the center of the chart: the LUX is re-inserted and the link with the Six fingered is reactivated. it changes his behavior, character, decisions and so on… The original is now ready to go back in the human society, till the next abduction, while the aliens hope that he will not remember anything and that he does not develop an awareness of this issue, otherwise the abductions wouldn’t be possible anymore, as we will see later in this work. Life won’t be as easy for the copy: it’s main purpose is to save a backup memory for the AAM in case this one gets to be lost if the original dies. So the copy lives almost in a suspended Animation-like state, until the possible moments in which it is necessary to replace, for short periods of time, the original. Yet we have strong suspicions that the copy is being used also for military purposes in order to create and test some kind of “decerebrated supersoldiers”, who obeys to any programming used by the military itself. I need to make clear now that I won’t talk about the relationship between the military colluding with the aliens, since this subject still requires a more in depth study which I will do only if I will have a long life, which is unlikely. We also need to underline that the abductees’ memories really make one think: we are talking about dreams and memories in which the abductee fights during a weird military training, but a very realistic one. There’s a question in the T.A.V. 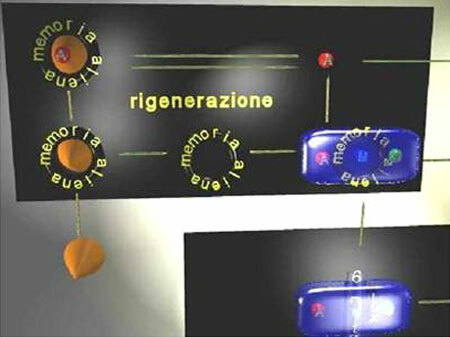 (Test di Auto Valutazione - Self Assessment Test,) which is just meant to verify if such memories are present. It is strange indeed that almost all of the abductees have this kind of memories/dreams which are pretty frequent and also seem to be very similar to each other. The weapons used are modern but conventional; the uniforms are not. At times the abductee says that he/she wakes up just like if he/she is living a “near death experience”, and that he/she goes and fights or escapes, or he/she is forced to practice particular exercises, like a war training or weird games… some kind of a training game. At the end of these he gets to be awarded if he was good (? - A.N. ); when he kills somebody, he always does it using particular martial arts and he seems to have an unexpected level of strength and agility. There’s no stress and no emotions involved in these war actions: there’s only the idea of having to fight without, but knowing the goals… some kind of brain program in which one doesn’t not even know why he/she is doing what he/she does. One only knows that the others (?) are the bad enemies. Now, after considering all of the above, we can take a look again to the whole chart given, and realize that now the whole picture is much clearer.